Ultimately, all cities who create a CBEI do so because they want to reduce consumption emissions. The CBEI should be seen as a tool to support emissions reduction, not just a standalone accounting exercise. Note that these guidelines expressly distinguish between behaviors and the policies or actions a city might implement to induce, encourage, or compel consumers to engage in these behaviors. This distinction is made to purposely encourage thinking about GHG mitigation through a “consumption-based” lens. Thinking in terms of changing consumer behavior can lead to unique policy approaches that address a wide cross-section of a city’s total “carbon footprint.” At the same time, this approach should be viewed as a supplement to—not a substitute for—traditional policymaking on GHG emissions. In many cases, it may be more straightforward to simply regulate what producers do—lowering the carbon intensity of the goods and services they deliver to market—rather than approach everything from the perspective of consumer demand. General guidance for each of the three steps above is provided below. 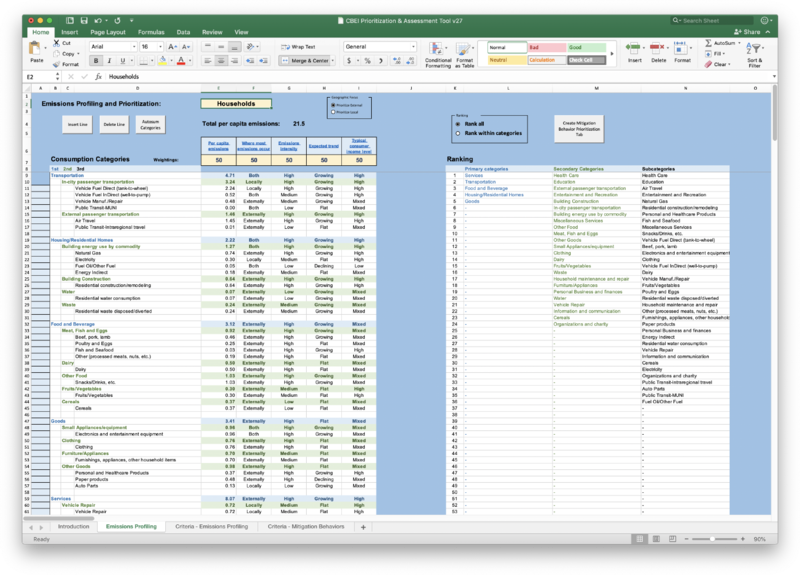 For a structured approach to identifying and prioritizing emission reduction approaches using CBEI estimates as a starting point, consult the CBEI prioritization tool. A CBEI provides important information on what are the largest sources of consumption-based GHG emissions for a city. 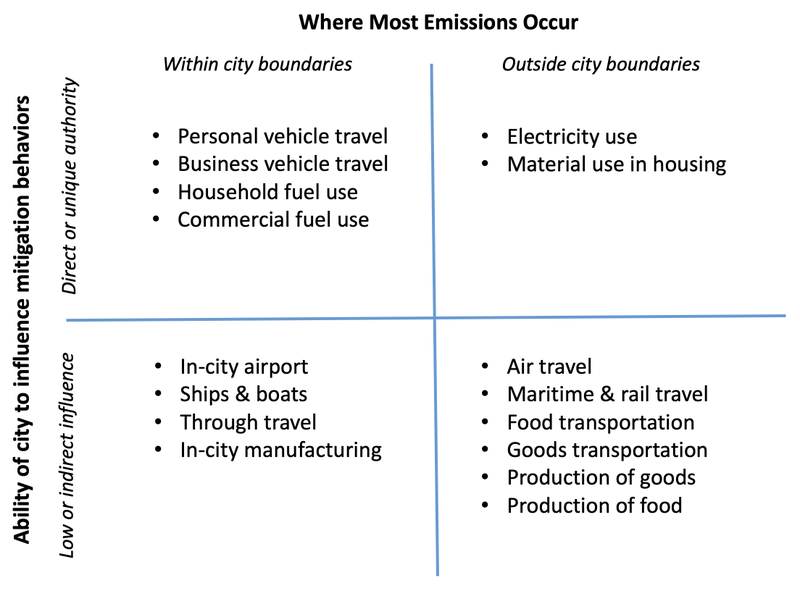 Do emissions occur within or outside city boundaries? Cities generally have greater influence over emissions that occur within their boundary, but at the same time, these emissions may already be captured in existing (territorial) inventories and addressed in existing climate action plans. When thinking specifically about consumption-based emissions, cities may wish to emphasise actions that are missing from current emissions-reduction plans. For example, food consumption is often unaddressed in climate action plans, because in many cities production occurs outside boundaries and is not counted in territorial emissions. 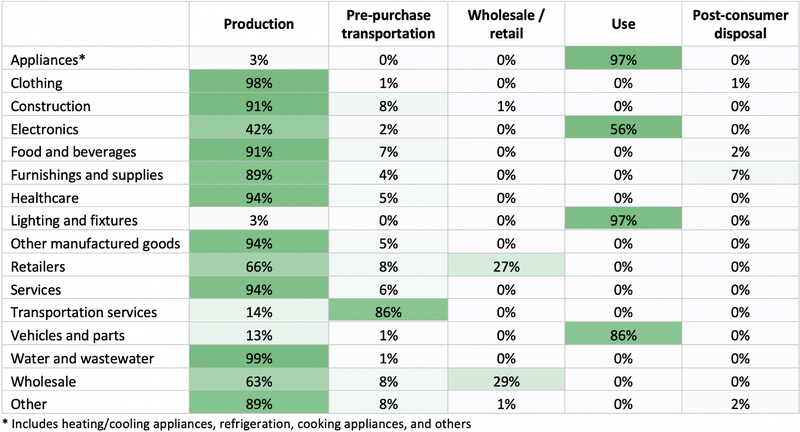 To get a sense of where emissions typically occur in the supply chain for different categories of goods and services (to understand what is likely to be emitted inside and outside city boundaries) see estimates from the State of Oregon’s CBEI. Where are the opportunities to shift consumption to lower emissions categories? Some categories of emissions have a high GHG-to-dollars-spent ratio (or “emissions intensity”). Encouraging consumers to spend less on these categories (and shifting consumption to goods and services with low emissions intensity) will have a greater effect on emissions than a similar reduction in spending in other categories. Moreover, focusing on these categories can help mitigate “rebound” effects: if emissions intensity for a product is high, then even if consumers switch consumption to other products or services they are still likely to achieve a net reduction in emissions. Emissions intensities can be derived from the results of input-output models used to generate CBEIs. Where these underlying results are not readily available, however - e.g. if using a CBEI generated by third parties - the results from other CBEI studies can be used as a general guide to assessing emissions intensities (see for example, illustrative figures from the State of Oregon CBEI). What are the expected future trends in emissions? We can reasonably expect emissions from some types of consumption to decline or increase in the future. For example, if a city is based in a country with stringent energy efficiency standards, they might reasonably expect emissions from appliances to drop over time, without any local policy interventions. If per capita emissions for a particular product or service are likely to grow over time, however, there may be greater urgency to mitigate them. For any given category of consumption, consider whether emissions are likely to grow, stay flat, or decline, and whether some categories should be prioritized based on expected trends. How does a given category of emissions relate to income levels? It is well established that consumption (and consumption emissions) corresponds to income—as incomes rise, we tend to consume more overall, and also more of certain things. Moreover, studies suggest that beyond a certain threshold, such consumption does little to improve well-being. From an equity standpoint, cities may be interested in prioritizing types of consumption that tend be associated with higher-income households (such as air travel). After reflecting on these questions (or using the CBEI prioritization tool to examine them more thoroughly), some priority categories of consumption should emerge for policy intervention. The next step is to think about what types of mitigation behaviors might effectively reduce emissions within each of these categories. Once you have prioritized which categories of consumption to address, the next step is to identify and prioritize possible behavioral changes that could reduce GHG emissions in those categories. Cities should try to identify behaviors to address consumption emissions in each of these three categories, using this list of mitigation behaviors as a starting point. In addition to thinking broadly about the different kinds of behaviors that could reduce consumption-based emissions, it is important to consider both behaviors specific to a particular (targeted) type of consumption, as well as general emission-reducing behaviors that can have a cross-cutting impact on the consumption of a range of goods and services. To reduce energy consumption in residential buildings, for example, one desired behavior would be for households to purchase energy efficient appliances. However, another relevant behavior would be choosing smaller dwelling units, which reduce the energy needed for heating and cooling, but also encourage lower consumption of many consumer goods. Cross-cutting behaviors hold the potential for deeper, transformational changes in consumption-based emissions. To identify cross-cutting behaviors, it can be useful to think about actions applicable across larger categories of consumption rather than individual goods and services. The CBEI prioritization tool accompanying these guidelines can be used to identify relevant behaviors at different levels of aggregation. What is the abatement potential? Behaviors with biggest potential to reduce emissions should be the highest priority. What is the likelihood consumers will adopt and maintain the behavior (aka “behavioral plasticity”)? Not all behaviors are equally likely to be undertaken by consumers, or remain durable over time. The percentage of the population who changes their behavior may depend, for example, on the economic costs of changing behavior; availability of alternative technologies or infrastructure; and non-economic (e.g., psychological) factors or stimuli. Researchers have estimated the plasticity for a range of different kinds of mitigation behaviors, which can provide good insight into the types of behavior that might be more successful in reducing emissions. What is the potential for “rebound” effects? Certain kinds of mitigation behaviors—especially those that involve directly reducing consumption—may save money for consumers. This will free up income that may then be used to increase consumption of other goods and services. In a “worst case” scenario, consumers might even end up consuming more higher-emitting goods and services, negating the GHG reduction benefits of their initial behavior. Rebound effects can be mitigated by focusing on goods and services with higher emissions intensities. All else equal, however, it may be desirable to focus on behaviors that have lower rebound potential. This would be the case for many "switching" actions, for example, where consumers see little change in their level of expenditure, but instead simply switch to a lower-emitting alternative. Where can local government have the greatest influence? For some types of behaviors, cities may have limited influence—they can’t manage production processes outside their boundaries, for example, nor can they bring in new policies that overstep their jurisdiction. In some cases, a particular behavior might be more effectively targeted by higher levels of government (e.g., purchasing energy efficient appliances). It may be prudent to emphasize mitigation behaviors where the local government feels it can have the greatest unique influence. A city’s ability to influence emission-reducing behaviors will often—though not always—correlate with whether consumption-based emissions occur primarily within or outside city boundaries. Once a city has identified the key types of mitigation behaviors it wants to focus on, the next step is to figure out what types of policy actions to use to change behavior. Note that policy actions—like behaviors—can also be targeted or cross-cutting. For example, encouraging walking instead of driving can be accomplished through investments in pedestrian infrastructure, but also through zoning policies that encourage a range of mitigation behaviors (e.g. smaller dwelling units and use of public transit). Cities can help consumers better understand the emissions implications of their behavior, and help foster an environment that is conducive to making lower carbon choices. Examples of information programs a city could undertake include: providing brochures about how to recycle common products, distributing bicycle maps, or supporting industry training and programs (e.g. training food or construction industry workers on the carbon intensity of different alternatives). Successful information and behavior change programs typically address some of the underlying social and structural drivers of consumption, such habit, inertia, and status. For example, policy interventions timed when people are adopting new routines (e.g. moving, starting a new job, having a child), are more likely to shift behavior—e.g. providing transit maps and tickets to new arrivals to a city, or recycling training to residents moving into a new development. Likewise, because people often consume as a signifier of status, designing campaigns that sell consumption shifts as an aspirational lifestyle, rather than a deprivation, are more likely to succeed (e.g. having celebrity chefs market low carbon foods as a luxury option). It is important to note, however, that while information provision is important, it is rarely sufficient on its own to shift behavior. Information campaigns are best undertaken in conjunction with other policy options that address the barriers to sustainable consumption. ‍Cities can play an important role in coordinating local action, and recognizing best practice in sustainable consumption. Cities can highlight good initiatives through the provision of awards, or by profiling best case examples in events and publications. For instance, many cities offer green business programs which can help engage local companies, and signal to consumers which businesses are reducing their environmental impact. Cities can also provide important logistical support for households and/or businesses who are aiming to reduce consumption emissions. For example, cities can use public space for activities that promote sharing and reuse (e.g. providing tool lending at public libraries), streamline permit applications for public events or green facilities, or help connect groups together in the city to reduce waste (e.g. food retailers with charities who may be able to distribute unsold items). ‍Where possible, cities can use their regulatory powers to prevent unsustainable consumption, or to encourage more sustainable options. Cities can restrict wasteful activities by enacting bans on unsustainable behaviors. The cities of Oslo and Madrid, for example, are enacting bans on the use of non-resident vehicles in the city centre, and many other cities are enacting partial bans based on fuel type or day. Cities can also lift restrictions that inhibit reductions in consumption. Removing minimum house size requirements, for instance, can help tackle multiple dimensions of consumption: smaller homes reduce embodied emissions from consumption, typically use less energy, have less storage space which discourages overconsumption of goods, and can be built more densely. In many cases, however, local government may not have the authority to introduce new regulations, or lift restrictions. Cities may have limited ability to implement more stringent policies, like efficiency standards in building codes, because these are often set at the national rather than local level. In these cases, the best option for local governments may be to advocate for reforms at higher levels of government. ‍Cities can guide consumers towards more climate friendly consumption choices using fiscal instruments. Taxes and fees can be used to disincentivize emissions-intensive forms of consumption, for example using congestion charges to limit driving, split-rate or land value taxes to discourage urban sprawl, or pay-as-you-go waste pricing to prevent excess waste. Alternatively, cities can provide incentives—such as tax breaks, subsidies and rebates—to encourage more environmentally responsible forms of consumption. Cities could steer developers towards dense construction near transit hubs, for instance, by offering fee waivers or tax credits. As with regulatory instruments, cities may be limited in the types of taxes they can enact. Cities may need to lobby higher levels of government to introduce carbon pricing and other fiscal reforms that would help curb local consumption emissions. ‍Cities can invest in public infrastructure that encourages low-emission behavior change, such as public transit, pedestrian infrastructure, and bikeways. Other emission-reducing investments could include (depending on how and where they are deployed) provision of parks and public spaces, facilities for sharing tools and other goods, and public IT infrastructure (e.g., to encourage teleworking). ‍Cities can model best practice in their own consumption behavior by creating a low carbon procurement strategy. Climate-friendly local procurement helps reduce the city’s own consumption footprint, demonstrates leadership, and can catalyse the development of efficient products by providing a guaranteed buyer for new technologies. Once a list of policy options is identified, cities should undertake an assessment to determine which option (or options) to actually pursue. This can be done using a city’s standard process for developing and evaluating policy actions (e.g., using criteria for political acceptability, budget impacts, socioeconomic effects, etc.). Note that in some cases, the best “option” may be to lobby for policy actions at higher levels of government (e.g., to directly target production- and transportation-phase emissions for some categories of goods and services). Dietz, T., Gardner, G. T., Gilligan, J., Stern, P. C. and Vandenbergh, M. P. (2009). Household actions can provide a behavioral wedge to rapidly reduce US carbon emissions. Proceedings of the National Academy of Sciences, 106(44). 18452–56.